Please check your Ship To address to ensure it is correct and review your Order Confirmation that is emailed to you. Call 800-225-3001 for any changes to your order. 7inX10yd PERF ROLL TOPPING Ships from NH only. 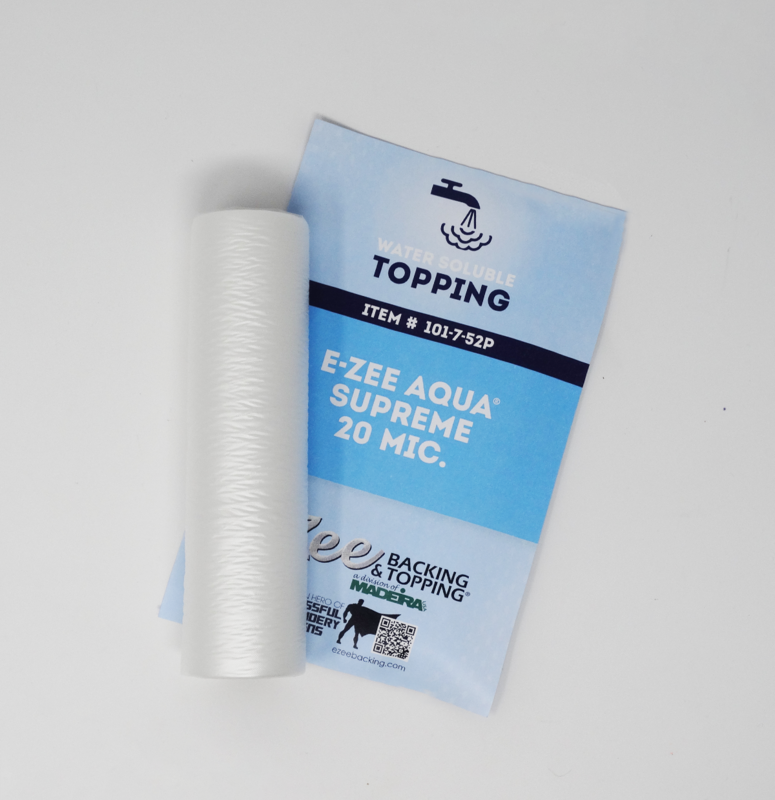 E-Zee Aqua® Supreme Topping 20 micron is a water soluble topping that prevents intricate parts of the design from sinking into the nap or pile and getting lost. The crispness of a design can be enhanced as well, especially when using a thinner 60 or 75 weight thread. Use on top of high profile fabric such as fleece, sweaters, corduroy and other soft knits. Cut a piece from a roll or use a piece of pre-cut E-Zee Aqua® Supreme Topping to fit your hoop size. Hoop by placing on top of the garment, or you may simply lay a piece on top prior to embroidering the design (using tape to hold it in place may be necessary). Embroider the design and remove the embroidered item from the hoop. Tear off the excess topping and wad it into a ball. Using a steamer or spray bottle with water, moisten any leftover pieces of topping on the design, giving it time to become tacky. Moisten one side of the excess ball of topping until it is tacky (you may need to add more topping to make the ball big enough to work with). Finish by using what is known as the “bubble gum” method to remove the left over pieces of topping on the design by dabbing at them with the tacky side of the ball of topping.